20190202 - Eddy Mountains via Parks Creek Road. Parking approximately 3/4 mile below Caldwell Lakes trailhead. A snowy, misty, cloudy day in the Eddy mountains today with partial clearing in the late afternoon. 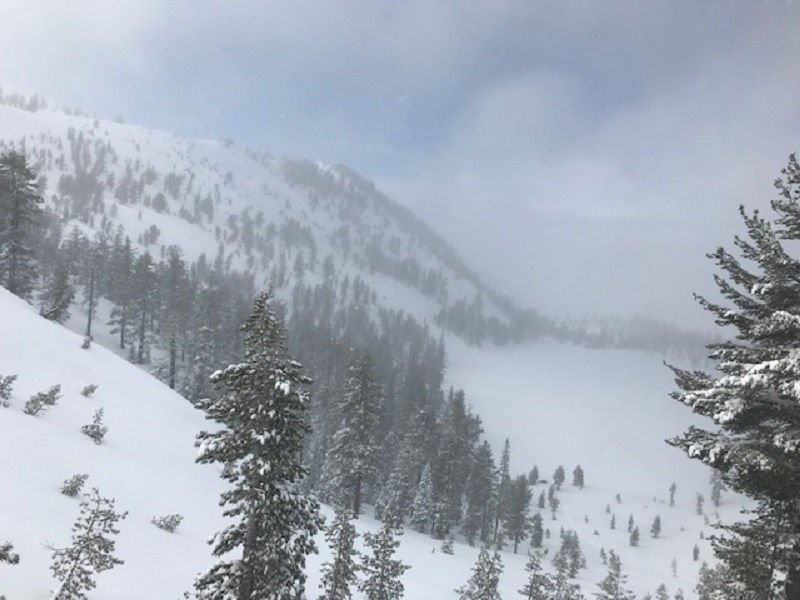 Snow levels lingered around 5,500 feet. Wet snow was observed < 7,000 feet with dryer snow above. Sky: 100% obscured / Precip: S-1 all day / Wind: light in drainages with local gusts, moderate along ridgelines out of the south. Wind loading: yes, northerly aspects. scoured to 3-4 inches on ridgelines/windy terrain. Minor cracking along corniced ridgeline. Cornices and cracking inconsequetial. Right side up snow configuration. Old snow/new snow bonding very good. No recent avalanches observed. Several density changes within the new storm snow were noted, at 5 and 17 inches from surface. Resistant planar ECT tests were able to produce clean shears at both layers, though without full propagation. Failure on a slope scale could be possible with further loading. Overall, good snow stability was observed. Poor visibility for most of the day. Brief clearing late in afternoon. Continuous snow throughout the day. Precipitation diminished in afternoon. South wind was light below and in protected areas near treeline. Wind could be felt above treeline and exposed ridges.